The cabinets have all oak veneered interiors with solid oak edges. The doors & end panels are De Santos rosewood veneer with an integrated concealed handle detail. The graphics are courtesy of artist Ben Allen & have been screen printed on to the panels prior to being spray lacquered. The worktop is stainless steel with a seamless underslung sink, convection hob, gas hob & BBQ grill. The island unit is the hub of this kitchen, with a couple of sweet spots incorporating extended views through to the open planned snug room & garden. A light, very sociable space to enjoy a rather nice relaxing sundowner or party party party. When deciding the design for our new kitchen extension and kitchen fittings I wanted an island unit that was bespoke and unique to us. Having been round and seen Marks designs and furniture at his Open House last year I thought Square One Design would be perfect for the job. I had some designs in mind of what I wanted and went through these with Mark on his first visit to us. Above all I wanted something unique, that no one else would have, coupled with something that would reflect my personality! After a few design consultations and sorting out the measurements we worked together to come up with something that was completely different. It was really refreshing to work with someone who had both vision and appreciated my sense of style and was prepared to work on something that was a little out of the ordinary. At no stage did Mark insist on me going for something run of the mill which was great as so many builders and tradesmen I’ve worked with in the past like to keep it as simple as possible. 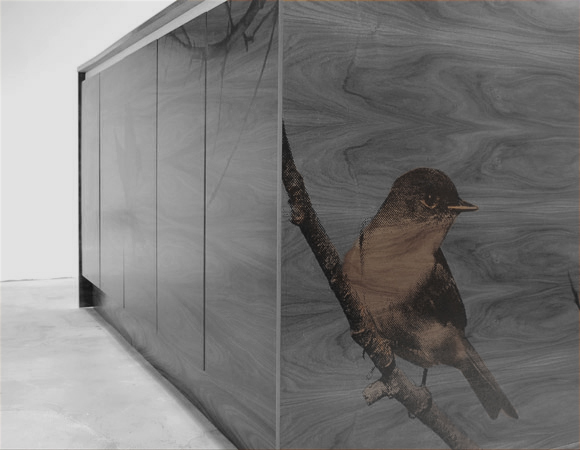 Upon deciding on the type of wood and finish to the island unit Mark suggested getting a local and well known artist Ben Allen to design a screen print on the doors. This was perfect, and reflected the type of artwork and finish to the rest of my house, it would fit in perfectly. Mark also help me source the stainless steel worktop, infact he took over the entire thing and not only sorted it, but liased constantly with the worktop company and fitted in all the appliances I needed to complete it. And Wow, what an island unit.